Cannon School honors Class of 2012! 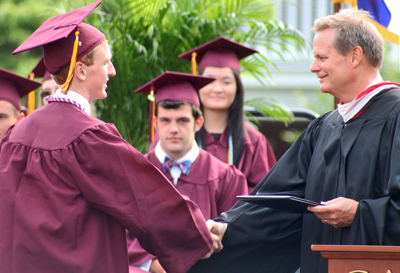 The eighty-six students in Cannon School’s Class of 2012 received diplomas in a May 18 graduation ceremony. Commencement speaker Chris Gruber, vice-president of admission and financial aid at Davidson College and a former chair of Cannon’s Board of Trustees, encouraged graduates put aside “the buzz” of mobile devices and other modern distractions to focus instead on nurturing meaningful relationships with family and friends, doing the right thing, taking risks, and controlling their futures. This fall, graduates will continue their educations at schools that best fit their unique talents and interests, including at some of the nation’s leading colleges and universities (see the map). Congratulations, Class of 2012! We couldn’t be more proud of you!